Why does the medicine not make him better?? 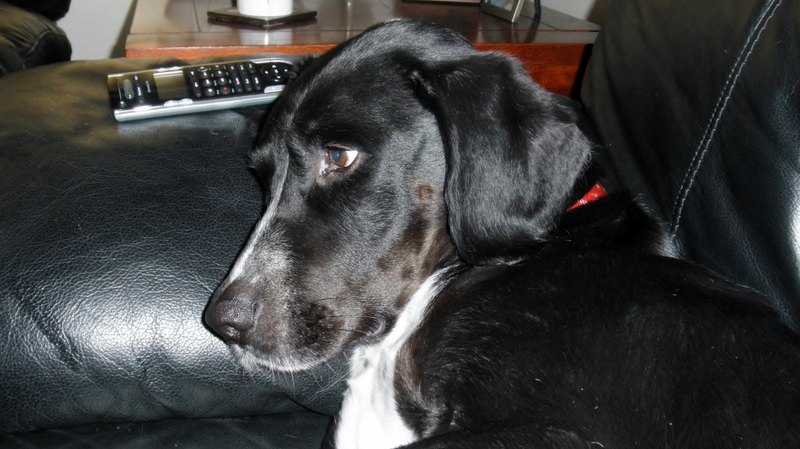 Hi it’s Jack… Last Saturday I was on the couch with my Owner, watching the All Black’s v Scotland rugby match. One of my jobs is to guard the TV remote from all threats, including the Cat and as you can see from the picture I do it pretty well. In reality though, I just love being on the couch with him , he knows it, I know it, even the Cat knows it. A thought struck me (happens once in a blue moon!) My Owner takes his 3 tablets, a yellow one, a white one and an orange one, 3 times a day every day… but the weird thing is he doesn’t seem to be getting better!! I have been with him for 3 years (human ones!!) and he just seems to be getting worse, not better. He freezes a lot more, he get’s tired quicker and he shakes a lot more. I can help with the freezing, I just give him a nudge on the knee, and as for the shaking? I just put my head on his lap and that usually calms him down. There is however nothing I can do about the tiredness and this really worries me, because I won’t be here for ever and what will happen when I am gone? So what is going on???!!! All this medicine, for all these people and yet they still get sick and not only that, but they get sicker? My Owner want’s to dance with his daughter on her wedding day, he wants to do this so very much. The only way for this will happen is a cure for Parkinson’s and soon, because I won’t be here to look after him for ever. So please work together; the medical community, politicians, pharmaceutical companies, patients, their families and friends… All of you working together, you can do this. How? Neurology is underfunded in most countries, so demand more from the politicians you vote for to make it a priority. Stay current with the research and most importantly, please, please continue to support the patients their families and friends. < Previous Ask him how he is…he won’t bite and neither will I. How true is this. My other half is an entertainer.twice weekly I go with him,I want to dance and get asked to dance, but I cant. Cynde… not meant to make you cry..
You will dance at your daughters wedding!!!!!! Michael J Fox has an audio book out – you need to hear it.